In ancient Greek mythology, Amphitrite was a sea-goddess and wife of Poseidon. Under the influence of the Olympian pantheon, she became merely the consort of Poseidon, and was further diminished by poets to a symbolic representation of the sea. In Roman mythology, the consort of Neptune, a comparatively minor figure, was Salacia, the goddess of saltwater. 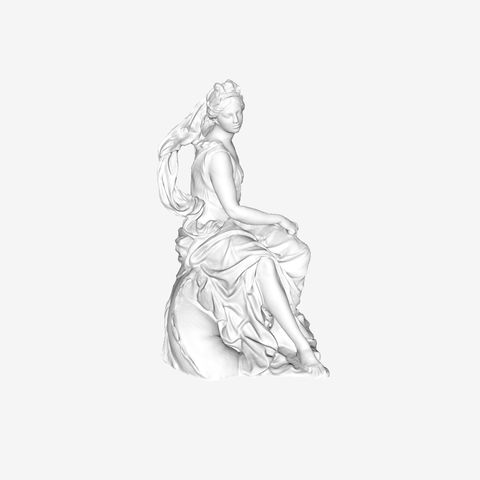 The goddess of the sea Amphitrite, one of the four groups commisssioned for the "river" in the Parc de Marly, was a companion piece for the statue of Neptune at the foot of the waterfall. The plaster model was put in place in 1699 and the marble version executed in 1705. Taken from the Parc de Marly in 1796, the group was used to decorate a fountain in Brest in 1801. Amphitrite and Neptune are two of the four groups commissioned from Antoine Coysevox in 1698 by Jules Hardouin-Mansart, superintendant of the royal buildings, for the large waterfall in the Parc de Marly, together with the Seine and the Marne (Louvre). Coysevox made the plaster models in 1699, but waited until he had finished another royal commission for the Horses of Renown and Mercury (Louvre) before carving the marbles, which were finished in 1705. Seized during the Revolution, the statues were sent to Brest in 1801, Neptune being placed in the Cours Dajot and Amphitrite used to decorate a fountain. They were sheltered in the Château de Kerjean from 1940 to 1953, then in the Château de Champs-sur-Marne before being brought to the Louvre in 1966. Amphitrite and Neptune were placed at the foot of the waterfall, near the pond, and the Seine and the Marne at the top. They made up a symbolic representation of the territory of France, in which the waters of the rivers of the Île-de-France flowed towards the sea, the domain of the sea gods. As Amphitrite and Neptune were placed at a lower level, and so nearer the spectator, they were made smaller to compensate for optical effects. Although they were sculpted in the round and could be viewed from all sides, they were designed to be seen from the front - that is, from the royal pavilion. The statues are companion pieces: the poses are symmetrical. Amphitrite's left arm, gracefully raised to catch her veil, balances the right arm of the god brandishing a trident; their faces are seen in profile facing one another. Their characters are contrasted, offering two aspects of the sea: unleashed or calm. Neptune represents power and movement, his wife Amphitrite, peaceful grace. The sea god is dynamic and angry, struggling to master a rebellious sea horse that he is pricking with his trident. His whole body is mobile: his legs are braced, his chest twisting, his hair and beard flying. The swirling drapery matches his movement. His noble head expresses divine authority. The horse is kicking against him, its mane bristling and its head flung back, with flaring nostrils and gaping mouth. Amphitrite is calm and smiling, sitting on a placid sea monster. A mantle is draped nobly over her legs in large folds. As in classical representations of marine triumphs, the wind is gently stirring her veil behind her. Beside her, a joyous Triton is playing with a horn of plenty full of the riches of the sea.